There is no one way to clean a bike. It’s controversial. What isn’t these days. I have changed my methods over the years, but my bikes look forward to a weekly wash, sometimes more frequently, depending on use and road conditions. I love washing my bikes, and detest working on a dirty one. I won’t do it. So don’t expect me to work on your bike if you roll up to the back gate and your bike is encrusted in dirt and grime. 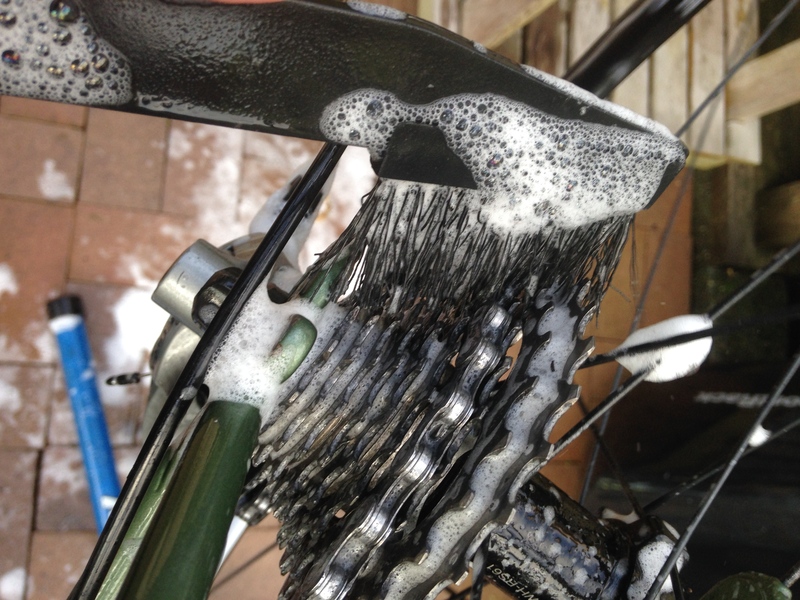 A thorough bike wash doesn’t have to take long. Chas doesn’t have to soak, sip on a scotch, and read a good novel like I might. I have it down to 10-15 minutes at most. In fact, the more often I do it, the quicker it gets. So, don’t tell me you don’t have the time. You do. And, you don’t need a lot. 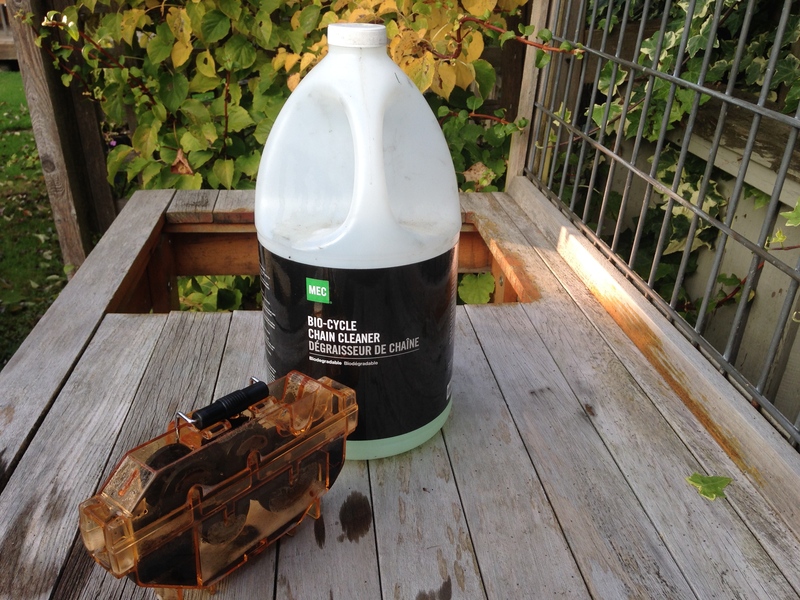 A hose and water, a pail, mild soap, a wash cloth or glove, a scrub brush, degreaser, and a chain cleaner. First, I put my gum boots on. If possible, I pick a warm sunny day but have been known to wash my bikes in the pouring rain. I bring the work stand out of the shop and place it next to the vegetable garden. This way I can serve two purposes. Chas gets clean and the garden gets watered. And then, I lightly hose Chas down to loosen any dirt. I used to worry about getting Chas wet, particularly his bottom bracket, hubs, and headset. I don’t now. They are pretty well sealed and, besides, they get cleaned and repacked every year anyway. Right? Then I fill a pail with water and mild soap. Chas prefers warm water, so I occasionally fill the pail inside where I have hot water just to stop the squawking. Yesterday, he had a chilly bath. Using a wash glove once used for the cars, I srub down the entire bike – frame, forks, tires, rims, derailleurs, brakes, cassette, chain, cranks and pedals. I’ve got this step down pat. It only takes a few minutes. 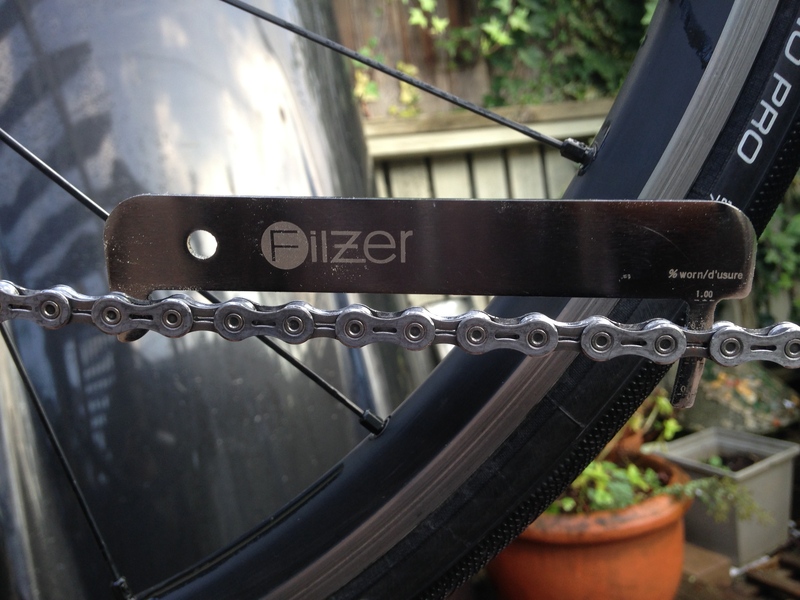 Next, using a gear cleaner from Filzer, I scrub the cassette and chain while back pedalling to make certain all links and cogs are cleaned. If it is really dirty, I will pour degreaser on the brush at the same time. The chain is next. Using a chain cleaner tool filled with biodegradable cleaner, I pass the chain over the brushes 10-15 times by turning the cranks. This is the most important tool in the shop, and the one used most frequently. Whenever I’m preparing for a long ride, I always clean the chain beforehand. I want the shifting to be smooth and precise. 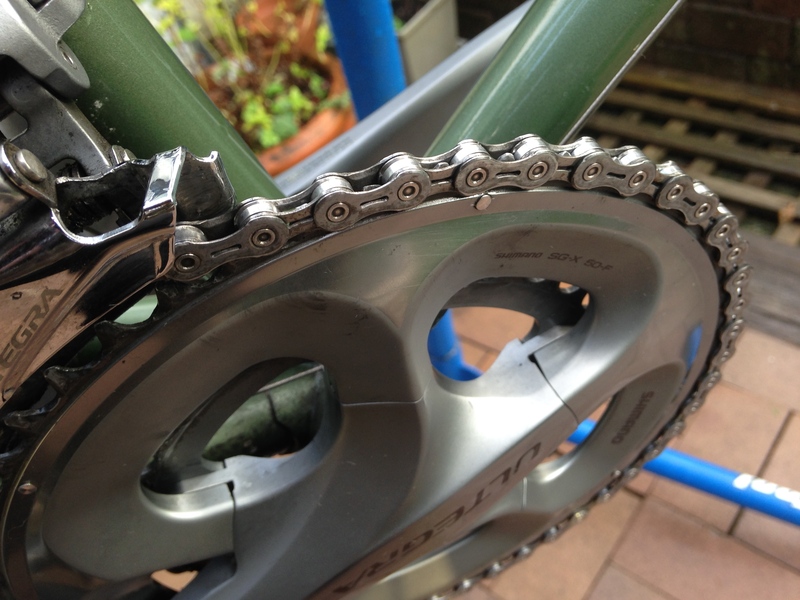 See what a clean chain looks like. No dirt. No grease. No oil. While I’m at it, I may also check the chain wear. I watch this carefully and replace the chain and cassette whenever necessary. Chas’s chain has some life left. Riding 3 bikes cuts down on the wear and tear so I usually get a 9-12 months on a chain. Lastly, I wipe Chas down with a clean cloth removing any excess water, and then hang him to dry. If I’m in a hurry to ride Chas, I will lubricate his chain but I prefer to let the chain dry completely beforehand. It only takes a few minutes to lubricate his chain and I prefer to do that immediately before the next ride when I also check the brakes, stem bolts and shifting but that’s a subject for another post. Chas patiently awaiting his next ride. Becky of Restart Urgently Needed nominated me for this challenge. She wanted to hear more about my bikes she said. Thank you Becky 🙂 I have to write 5 posts about my bikes and, with each post, nominate another blogger to accept the challenge. With the first post, I nominate Ellie (A Writer’s Caravan) for the 5 day story challenge because I would love to read how music has shaped her life. And, I want to hear more of her music. With the second post, I nominate Bri (Bike Like Crazy) for the 5 day story challenge because I would love to read more about cycling in cold, and snow. Bri is an inspiration to all cyclists. With this third post, I nominate Gail (a bike for all seasons) for the 5 day story challenge because I would like to learn how she has been changed by her cycling project – an experiment to cycle more and use her car less for a full year. 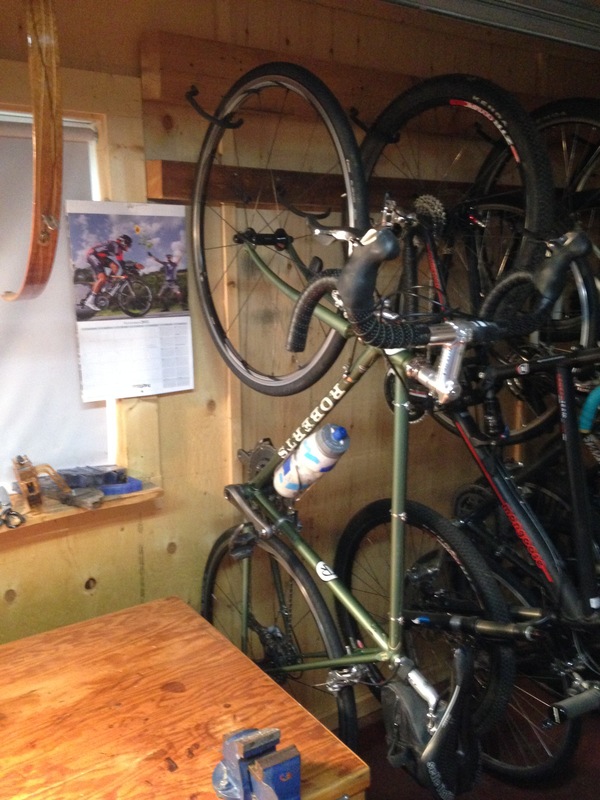 This entry was posted in Cycling, Photography and tagged Bike Wash, Chas, Roberts Cycles, Ultegra by PedalWORKS. Bookmark the permalink. I get to wash my both of my bikes today! I am embarrassed by how little I used to wash my pink mountain bike, which is the main reason she was destroyed by the harsh winter. Now, I just think of bike washing as a normal part of the routine. Our bikes deserve a little TLC after working so hard for us. I’ve never washed Busby. The chain is enclosed so I’m not sure I can clean it without pulling it all apart. Thanks! It was time for a new avatar. You’ve just made cleaning a bike so much more interesting Gary. I wash my bike quite regularly but not often enough. We have a lot of sand to contend with on our pathways and salt air, which means rust happens easily. 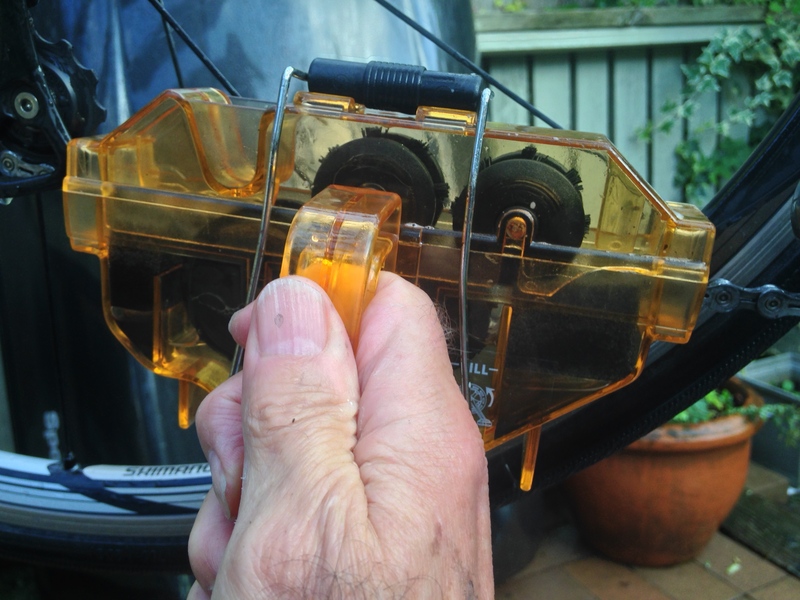 I appreciate the tips about the gadgets and products that you use. The chain cleaner looks excellent. Thanks! Being a bit of a lazy/ mucky pup at times I’ve been trying a new chain lube called Squirt., which I’ve mentioned elsewhere. It’s a wax based lube and the muck just flakes off the chain, I’ve found it excellent so far after 2,000 miles. Drawbacks, you have to degrease the chain before you fit it. I did this after running it for a while till it needed relubeing (is that a word?) I found it awkward at first to judge when it needed topping up. It’s water based and makes the chain & changes delightfully quiet. So far there seems little chain stretch either. Through the summer ;dry for a change) I’ve just wiped it occasionally with a cloth – great! Be interesting to see how it copes now the Scottish rain has arrived. Would I buy it again? You bet I would. I haven’t seen Squirt. I’ll take a look in the local shops. Thanks for the tip. I haven’t cleaned my bike and I’ve had it two years. I’d better get right on that!